My favorite dining experience in San Francisco was at Credo, a casual Italian restaurant and bar in the Financial District. Italian and Latin for “I believe”, Credo’s modern and laid-back environment is anchored by quotes from notables ranging from Andy Warhol to Gisele Bündchen, all beginning with “I believe…”, that span a plethora of topics, ideas and viewpoints. These unique walls are a feast for your eyes, and perhaps even inspiration for some good dinner conversation. The menu is simple, yet full of fresh and flavorful dishes that marry Italian culinary traditions with fresh ingredients that are characteristic of northern California. I enjoyed the endive salad with balsamic figs, a Neapolitan-style Margherita pizza and hazelnut mousse for dessert, but the menu offers a variety of other items ranging from English Pea Tortellini to Pan Seared Salmon, plus some amazing specialty cocktails. 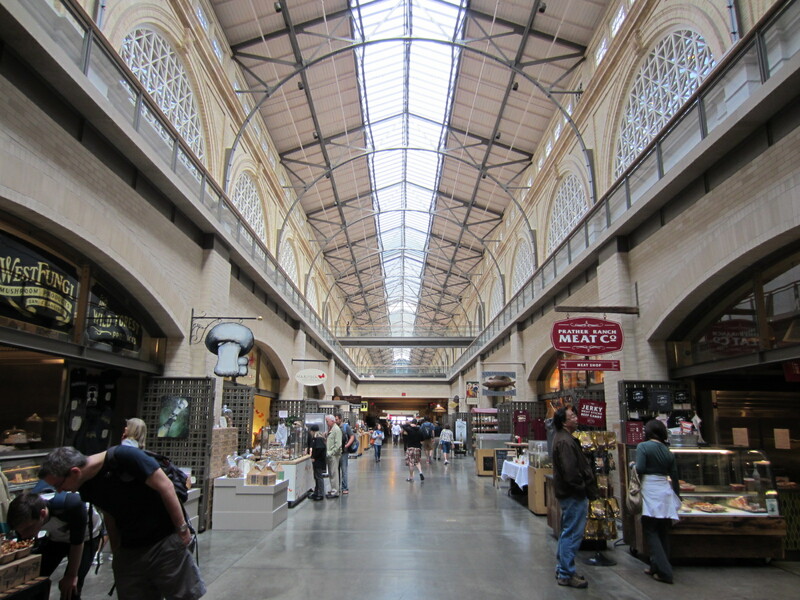 Located on San Francisco’s Embarcadero, there is no shortage of food options at the Ferry Building. If you find yourself there on Saturday mornings, you can graze on some of the beautiful produce at the Ferry Plaza Farmers Market (I’ve never seen so many varieties of radishes in one place!). There’s also a smaller version on Tuesdays and Thursdays. Inside the building, you’ll find a handful of locally-owned artisan shops and restaurants, ranging from bread and cheese to wine and seafood. Perfect for perusing, then grab a bite and head outside to enjoy the waterfront and view of the Bay Bridge. For a casual sit down meal or cocktails check out MarketBar, which offers a rotating menu rooted in fresh, seasonal ingredients that are primarily sourced from other Marketplace merchants and the weekly farmers market (I love this). The café tables that line the front also make for great people watching. I’m a sucker for a good café, and Stella was one that we paid repeat visits to. Located in North Beach, San Francisco’s Little Italy, this small little bakery and café has offered an assortment of traditional Italian desserts, pastries and cookies since the 1940s. During one visit, we tried tiramisu and cannoli, which were both light and creamy in texture and the perfect after dinner treat along with an espresso. On another visit, we sampled a variety of cookies, my favorite being the pignoli pine nut-covered cookies, just like the ones my family used to get in New York. 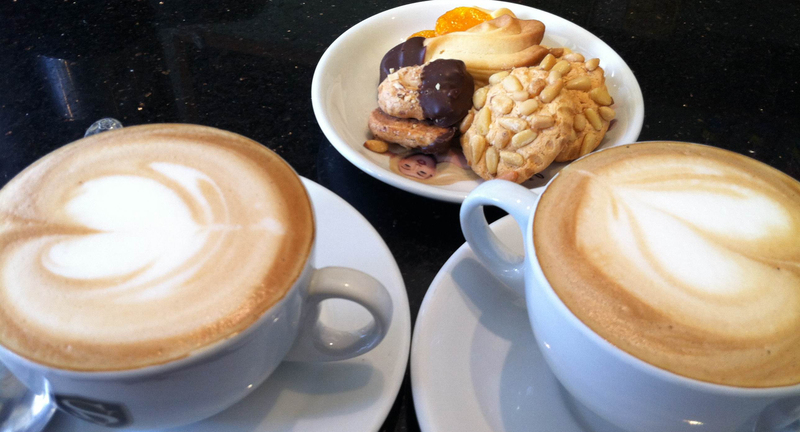 Paired with a cappuccino, any of these treats make for a great mid-morning pick-me-up. Billed as “a San Francisco institution since 1938”, Sears Fine Food near Union Square was recommended to me by several friends and family members who have eaten there throughout the years. The restaurant was founded by a retired circus clown who became known for his World Famous 18 Swedish Pancakes, a recipe he inherited from his wife’s Swedish family. The historic atmosphere is filled with vintage furniture, posters and other artifacts, and has a broad menu of hearty breakfast staples (they also serve lunch and dinner), including their signature Swedish pancakes. One fun fact about the early days of Sears is its “Cadillac waiting room”. The original location had only 16 tables that could seat about 70 people, so the owners used to park 2 pink Cadillacs in front with the heaters and radios turned on to shelter the waiting crowds. Even though Sears moved to its larger, present day location in the 1960, about half a block down from the original, the tradition of its beloved Swedish pancakes continues today. The Stinking Rose prides itself on being “San Francisco’s first restaurant to celebrate the euphoria of garlic.” The Cal-Ital menu is inspired by the restaurant’s motto “We Season our Garlic with Food!” and aims to take garlic to the extreme. For example, the “Bagna Calda” or “Garlic Soaking in a Hot Tub”, which is basically garlic cloves in olive oil and butter, is not for the faint of heart. Garlic holds a special place in my kitchen at home, and the items we ordered were not as garlicky as I thought they would be (although we didn’t try the Bagna Calda). While the food was average, the hook for The Stinking Rose is its novelty – including its fun environment made up of vintage photos, wine bottles and garlic-inspired paraphernalia – and great location in the heart of North Beach. These look like good places to go in San Francisco. Great pictures too!